Starting today thru Monday, head to Do-Rite Donuts (which just so happens to be one of the best donut spots in the city) for this glorious creation: a St. Paddy's Day/Girl Scout Cookie mashup. 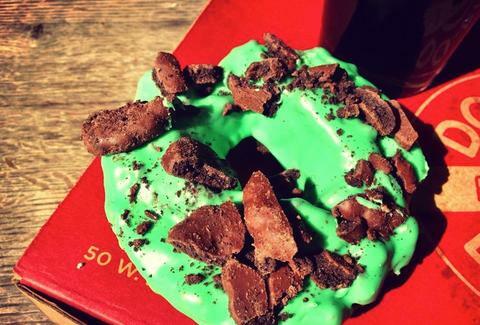 It’s called the Erin Go Bragh Donut , and it features a chocolate old-fashioned draped in mint icing, then decorated w/ scatted chunks of Thin Mints. That’s right, these Girl Scout Cookies really are made with craic. Julie Cerick is an Editorial Assistant at Thrillist, and is still waiting for Girl Scout Cookies to miraculously show up at her doorstep. Follow her on Twitter.